The worship tent in Porto Alegre will symbolize the declared goal of the WCC to be a space where churches call one another to visible unity in one faith and one loving communion. 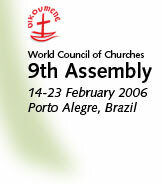 The large worship tent at the World Council of Churches (WCC) 9th Assembly in Porto Alegre will be a unique space and one of the main features of the Assembly life. Some 3,700 participants coming from churches from all over the world will gather twice a day under its white ceiling to celebrate their faith, hope and fellowship in Jesus Christ and to pray for greater unity. The WCC Assembly, the largest and most representative gathering of Christian churches from across the globe, will be a praying assembly. Its theme is itself a prayer: "God, in your grace, transform the world." Its deliberations and discussions, its policies and programmes will be shaped by the spirit of prayer to the triune God - the Creator, Sustainer and Saviour of all. The worship tent in Porto Alegre will symbolize the declared goal of the WCC to be a space where churches call one another to visible unity in one faith and one loving communion to worship the triune mystery of the Father, Son and Holy Spirit. And yet, the Christians who gather there will painfully recall that they remain divided for reasons of history, belief, cultural practices and institutional structures. All will be sadly aware that they cannot yet hold a common eucharistic celebration or any sacramental worship or, even less, an "ecumenical liturgy". But this will not prevent them from expressing their fervent and prayerful hope for the unity in Christ their Saviour, and affirming their common faith and trust in the power of the Holy Spirit who leads us into the truth. - What is it that prevents Christians from perfecting and celebrating our faith and communion in Christ our common Lord? - What are the doctrinal and historical obstacles that keep our churches divided? - What should we do now to witness to Christ crucified and risen as one united body of Christ? In its search for answers to these questions, the Assembly will seek insight and inspirations from these times of prayer and worship together. The great diversity of cultures and spiritual traditions represented in the daily prayers will undoubtedly provoke amazement among those present for the first time at such a global event. 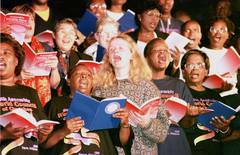 Diversity is God's gift to humanity, and the WCC Assembly and its worship are planned to bring out its beauty in many ways. Prayers and hymns, signs and symbols, rites and rituals drawn from various streams of Christian tradition will find their appropriate place in the worship life. Yet care will be taken not to mix them up in a way that masks the particular identity of a tradition or offends the sensitivities of any member church of the WCC and, as far as possible, every tradition will be represented in its integrity. To this end, the Assembly Worship Committee has given much thought to the reflections of the Special Commission on Orthodox Participation in the WCC. Following the recommendations of the Commission the Assembly's prayer life has been organized as inter-confessional or confessional services. Whereas inter-confessional common prayer in the mornings will draw on the liturgical resources of many confessions and traditions, the evening services will mostly be in the form of what the Special Commission describes as confessional common prayer, planned by a confessional family or tradition for the Assembly as a whole. However, one confessional family can invite another to lead a confessional service jointly if they both are in a position that allows them to celebrate worship together. That would be the case, for instance, of the evening prayer prepared by the Lutheran World Federation (LWF), which has invited the World Alliance of Reformed Churches (WARC) to join in. "By inviting our Reformed brothers and sisters to lead with us this evening prayer, prepared following a Lutheran liturgy, we wanted to give a tangible expression to our broader ecumenical witness and to our commitment to the ecumenical movement," says Rev. Dr Ishmael Noko, LWF general secretary. The Assembly fellowship in prayer is conceived in a wide framework of repentance, celebration and sharing. The intercessory prayers in the daily worship will no doubt be a moving experience for many. True to the calling of the church, the Assembly will carry in its prayer the whole world with its pain and suffering, its hope and joy. This will be an act of spirituality, offering the whole creation back to its creator in repentance and in joyful thanksgiving, so that the world may be transformed. Transformation of human persons, of sociopolitical structures, of our own churches and institutions in view of the Kingdom of God is central to the Assembly's theme and to the ecumenical movement. The Assembly will pray with one voice for the reign of God in the daily life of our world. In many ways, the Assembly worship will be an anticipation of our hope in the essential unity of God's world in spite of the present divisions and divergences. The Christian unity to which the WCC member churches aspire is not for the sake of the Council or even the ecumenical movement, but for the unity of all humankind and of the creation. Together, those present in Porto Alegre shall listen to the Word of God that recreates the world, and together, they shall offer themselves to the power of the Holy Spirit that transforms our lives. Fr Dr K.M. George, a priest of the Malankara Orthodox Syrian church in India, served as moderator of the WCC programme committee 1998-2006, and is principal of the Orthodox theological seminary in Kerala, India.